Holt of the Secret Service (1941) was the 16th serial released by Columbia Pictures. A murderous gang of counterfeiters has kidnapped John Severn, the U.S. government’s best engraver, who is being held against his will and is forced to print virtually undetectable phony cash. 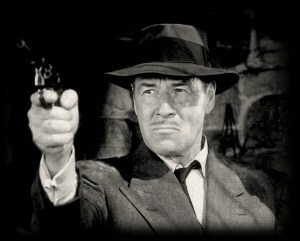 The United States Secret Service sends its toughest agent, Jack Holt, and his female partner, Kay Drew, after the gang. Holt and his boss Malloy decide to try to pass Holt off as escaped tough guy, Nick Farrel. Masquerading as the bickering Mr. and Mrs. Farrel, Holt and Drew manage to infiltrate the ruthless gang of thugs and the tough talk and action never stops from there on. Holt’s hunches lead him to the culprits and into trouble on a canoe ride and in an outlaw camp, as the action moves from the gang’s hideout in a lost canyon to a gambling ship on the high seas to a small island country where the gang hopes to escape U.S. extradition. The brains heavy is a man named Lucky Arnold but he hides behind the facade of one of his loyal henchmen, Quist, to shield himself from the Secret Service, and lets another one of his men, Valden, do most of his dirty work. The island nation has its own pocket dictator who is also trying to rub out our hero. During the 15 episodes, Holt endures numerous brushes with death, emerging from all of them with nary a hair out of place nor a crease in his well-tailored business suit.